Introducing: Old & New | A Continuous Lean. 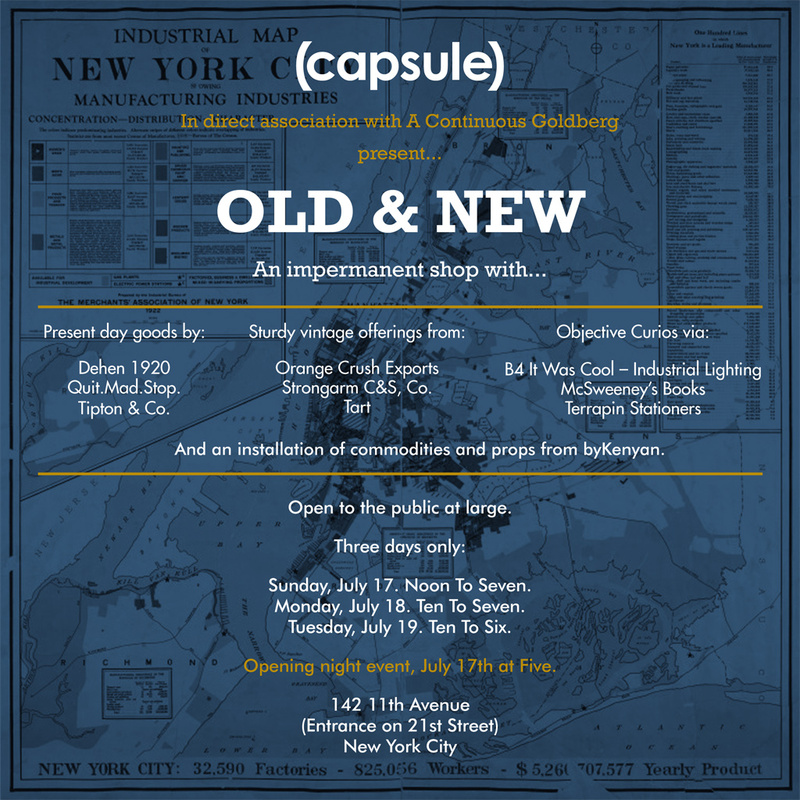 This weekend my good pal Randy Goldberg and I are teaming up with the folks from the (capsule) trade-show on an impromptu shop called Old & New. Starting this Sunday we’ve commandeered a raw space on the far West Side and filled it with vintage dealers, a few up-and-coming labels and other respected local makers like Terrapin Stationers. Old & New runs for three days, is open to the public and should prove to be good fun. All of the details below. Dehen 1920, Quit.Mad.Stop., Tipton & Co., Orange Crush Exports, Strongarm C&S, Co., Tart, B4 It Was Cool, McSweeney’s Books, Terrapin Stationers. And an installation of commodities and props from byKenyan. Open to the public at large. Sunday, July 17. Noon To Seven. Monday, July 18. Ten To Seven. Tuesday, July 19. Ten To Six. Opening night event, July 17th at Five. Awesome! Looking forward to checking this out. I can highly recommend Strong Arm vintage clothing who is part of this shop/team. For those who may not know John is one of the top 10 vintage clothing experts on the planet and has one of the most important clothing eyes in the world. I have been in vintage clothing for 20 years and bow my head! So go and see rare rare rare beautiful things…even if not to buy but to learn! McSweeneyâ€™s Books? Didn’t they go out with the dodo bird? Is this just a one time deal or are more events in progress? – sadly I won’t be in the area this weekend. are there going to be tipton & co camera straps? Your industrial map-announcement beautiful. Best wishes to each of you! I can’t wait to attend this thing…any chance I can get me one of them fancy vintage watches there? Been looking for a Benrus Sky Chief for about 6 months now…. Terrapin Staioners’ engraving is exquisite. For business, formal or informal stationers, their work is top notch! If any printed product was edible, Terrapin’s work would be dessert. Congratulations on having them in the show.